With 67 international goals Robbie Keane is Ireland's record goal scorer by a huge margin. Of that total he has scored 12 penalties through his Irish career. Keane played his first match for Ireland in March 1998 but did not score his first international penalty until the 2002 World Cup Finals (also notable for the infamous Saipan Incident) on the occasion of his 36th cap. Up to that point Ireland's regular penalty takers had been Manchester United's Denis Irwin and latterly, Ian Harte - both played at fullback. At the World Cup finals the Irish squad had emerged from their group to play Spain in the knockout stages. 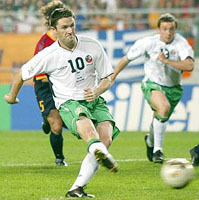 Robbie Keane had scored in two of the group matches against Germany and Saudi Arabia. His last minute equaliser against Germany was the only goal that the Germans conceded at the 2002 World Cup except for the two goals conceded in the final against winners Brazil. In the match against Spain Ireland had fallen behind to a goal from Barcelona's Carles Puyol but had an opportunity to equalise through an Ian Harte penalty. Unfortunately for the normally dependable Harte he saw his shot saved by Iker Casillas. When Ireland won a second penalty in the last minute of the match the young, but very confident, Robbie Keane stepped up to score his first international penalty thus sending the match into extra time. The match went into a penalty shoot-out. Keane took and scored the first Irish penalty but unfortunately the Spanish won the penalty competition 3-2. Having scored his first international penalty against a true football world power Keane has gone on to score other penalties against the likes of Cyprus, Faroe Islands, San Marino, Kazakhstan, and Gibraltar, amongst others. The full list of Robbie Keane's penalties scored for Ireland is below.